Prices realised for Irish notes • Is that how much it's worth!? This thread is for reports on interesting Irish banknotes sold in auctions. An ETO war code £20 in Poor grade sold for €1,050 plus fees in a recent (November 2014) auction in Dublin. With several bidders, this was well above the estimate, and establishes the lower end of valuations for the war code £20. This is the rarest Lavery Type note. This Northern Ploughman tenner fetched 14,000 Euro plus fees in Whytes, September 2013. Surely one of the the highest prices ever for an Irish Ploughman note in auction. Re: Prices realised for Irish notes • Is that how much it's worth!? This war code £20 note fetched 6000 Euro, also in Whytes. 16 April, 2011. Not a bad mark-up over face value! 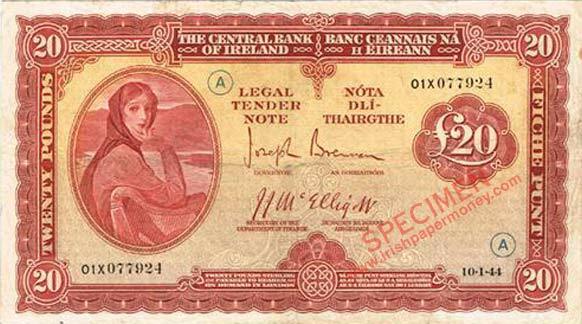 Dnw auction 27.04.15 produced some healthy results for Irish notes. There were some bargains also! 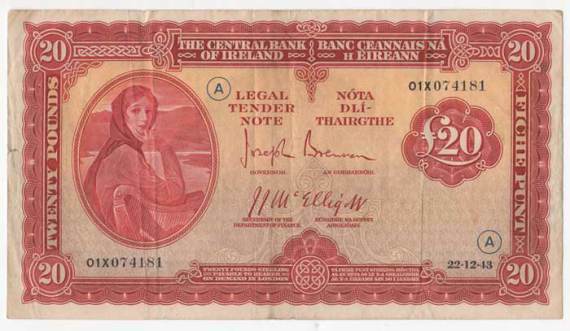 Lot 284, Central Bank of Ireland £20, 1955 (Redmond signature brought £1,100 plus fees. A very tough note in high grade, and well appreciated in this sale. Lot 306, Royal Bank of Ireland £5 brought £1,900 plus fees. Lot 307, Royal Bank of Ireland £10 brought £4,600 plus fees. 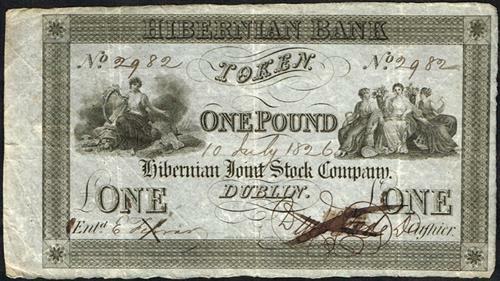 Lot 261, Bank of Ireland £10, 1914 brought £1,800 plus fees. Lot 312, National Bank £1 brought £1,700 plus fees. A healthy price for both of these notes, pointing to a strengthening in the value of Old Notes here. Lot 262 was interesting, a previously unrecorded variety of the small-sized Bank of Ireland £1 note. Whytes Auction today sold a Limerick Soviet 10 Shilling note for 1400 plus fees. The note pictured below had stiff competition. This is a very strong price for this type of banknote. 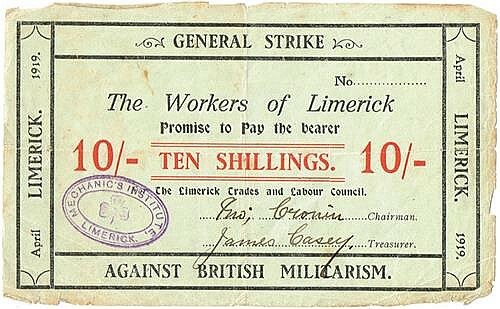 This note is a new addition to the survey of Limerick Soviet notes. Ploughman £10 notes continue to turn up in nice grade. The latest one, a Provincial Bank Forde signature (01PT 030439) 2.10.31 is out of a known run of gEF/AU grade notes, though this actual note had not been recorded previously and is thus new to the collecting pool. This note, from the middle of the run, was auctioned in Adams, Dublin on 12 April, 2015. EDIT: It did very well, fetching 4800 Euro plus fees. In the recent Whytes auction (June 13) a Northern Bank Knox signature £1 Note, fetched €5,631 including fees. Not bad for a One Pound Note. This is one of the rarest of the Ploughman series. 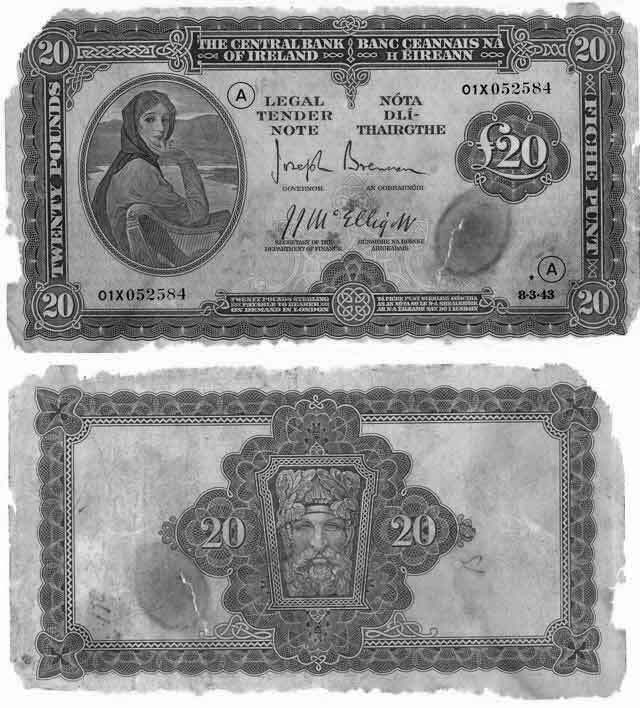 There were several interesting results among the banknotes in Whytes 'Eclectic Collector' auction of 14 May 2016. Several rare banknotes were on offer, including a war code £20 note, dated 10.1.44, and a Ploughman Provincial Bank of Ireland £10 note with Kennedy signature, dated 17.7./39. Both notes were in decent grade, in the Fine region, and both were expected todo well. The results surpassed expectations. The two notes were stiffly contested, with the Ploughman £10 note going to a room bidder, and the War code £20 going to a telephone bidder. Prices were very strong for nicer grade material, with a good range of decent Ploughman notes on offer, with some notes being in numerical sequence. Lower grade notes fared less well, with weak prices for poorer items. However, almost all the banknote lots sold, with the handful of unsolds being confined to notes with serious problems. This reflects the general trend in the banknote market. There was a good attendance in the room for the sale, with many bids from phone bidders, and two web-based auction sites. Lots were knocked down to all of these. Provincial Bank of Ireland Ploughman 17.7.39. Kennedy signature,fetched €10,500 Euro plus fees (€13,083). Lot 306, estimated at 1,200–1,500 Euro. Central Bank of Ireland Twenty Pounds 1944 war code fetched €9,500 plus fees (€11,837). Lot 325, was estimated of 4,000–5,000 Euro. 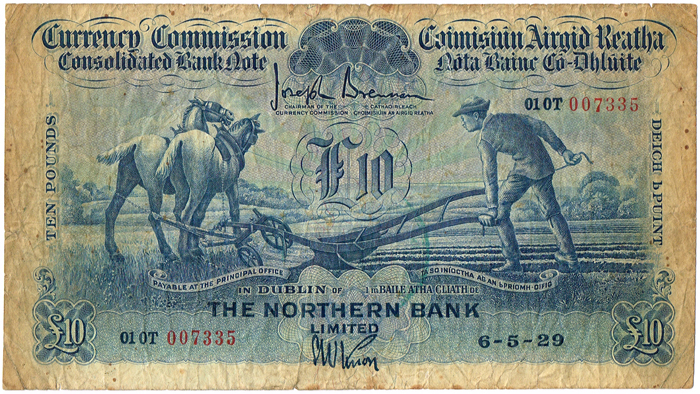 Other notable items were a 1919 Provincial Bank of Ireland £1 note; Bank of Ireland £5, 1919; and Bank of Ireland £20, 1915. All of these are rare items. The sale results are on Whytes' website. The results of the Heritage Auction sale were predictable enough. Most of the estimates were far too high on the Ploughman £5 notes. Two thirds of them didn't sell. And there were too many similar notes—good for the collectors. 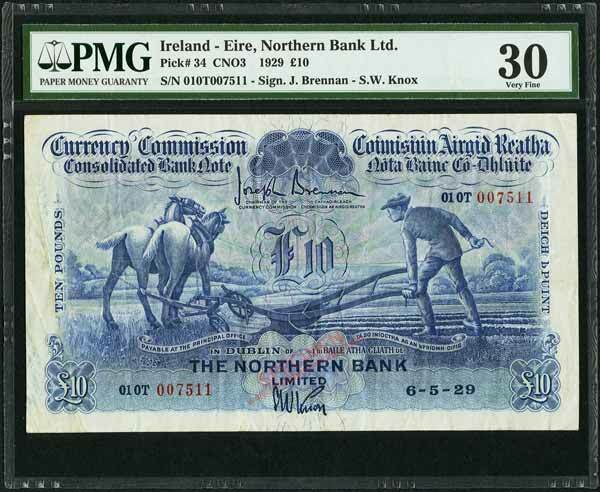 The Northern Bank Ploughman £10 note fetched a reasonable sum, $32,900 including fees (€29,200; £24,700), though at the lower end of the estimate range. 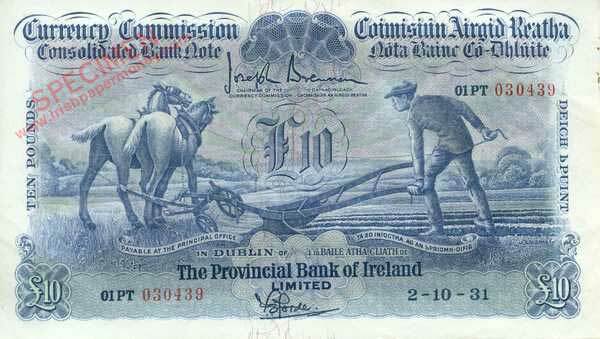 This is the highest price ever paid for a Ploughman note, and the second highest price ever paid for an Irish banknote. 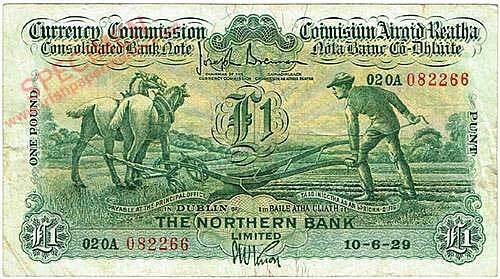 Ploughman Ten Pounds Northern Bank sold for $32,900. The Royal Bank of Ireland £5 note did well, at $2,350; ulster £10 at $5,287. The Lavery £20 notes were appreciated, and fetched prices in line with what they would be expected to realise given their scarcity, at $822 (1946); $578, 1949). The notes in this sale would probably have done better had they been sold by an auctioneer such as DNW in London, with more accurate descriptions and pre-sale estimates. The descriptions are rather puerile in some cases. Hibernian Bank Token dated 10 July 1826 fetches €2,700 in auction in Whyte's, Dublin. Whyte's Eclectic Collector auction on 21 January had a selection of rare issued Hibernian Bank Tokens on offer. The best of the Hibernian Tokens, Lot 486 ,an intact cancelled £1 note in about VF grade, sold for 2,700 Euro plus fees (approximately 25% in total). A decent result for a rare item, and well above the pre-sale estimate. Four more intact notes fetched between 660 and 1,800 Euro plus fees. Cut cancelled notes in low grade fetched less than 200 euro each, which may be an undervaluation given the scarcity of these items. however, it is also relevant that these Hibernian Token issues are very much niche items in Irish note collecting. I have only a 3 pound proof in my collection. The Whytes Eclectic Collector Auction on the 18th May had some interesting notes for sale. A 1931 Ulster Bank £5 Ploughman with the Patton signature did particularly well. The estimate was 800-1000 but strong interest resulted in a hammer price of 2500 euro. This is a difficult note to get in nice grade and the results reflect this. Last edited by DOC on 16 Aug 2018 21:05, edited 1 time in total. That's a really strong price for a Ploughman fiver these days. It shows that the money is there for good grade scarce notes. That's a nice grade. big price! There were some very high prices realised for Irish notes in the DNW auction of 10 April 2018. The results reflect perhaps a strong market for rare notes, and for scarcer notes in nice grade. Ulster Bank £10, 6.5.29 in About VF grade sold for £5000 + fees. Belfast Banking company £1, 6 April, 1916, VF sold for £1400 + fees. 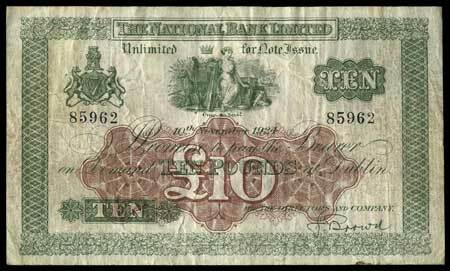 National Bank £10, 10 Nov 1924 VF/GVF fetched £4800 + fees. Auctions, and ebay in particular, can be very unpredictable in prices. It can depend on many things, such as whether interested buyers see it, or on how the listing is phrased, or if the picture looks good! Sometimes notes go cheap, other times they do very well indeed. A lot of the time on ebay they don’t sell as they are priced too high. 250 for a note with writing on the reverse would seem a bit high, though it depends on the grade of the note and on the degree of the writing. Yes, the picture and grade are important factors when selling on ebay. Nice looking notes tend to do well but lower grade examples frequently sell for less than expected. Postage costs can also be a factor. Bidders are resistant to high postage costs for lower priced items. Bargains can be found on ebay, particularly over the summer months when collectors are away enjoying the summer sunshine ! I do admit to getting some bargains on ebay occasionally. Need a good picture as some sellers are very inaccurate on grading.